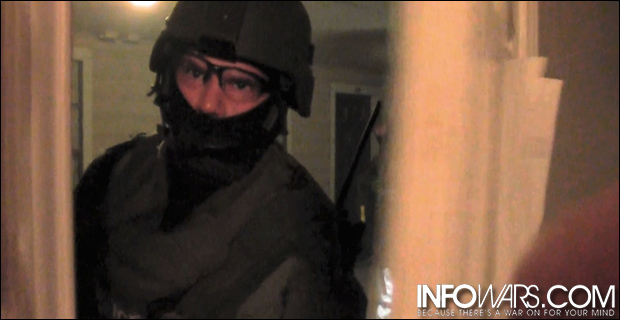 Infowars reporter Jakari Jackson, along with a few of his neighbors, received a rude awakening today when an aggressive SWAT team showed up to perform an early morning ambush. Jackson was startled out of his slumber around 5:30am when he heard someone banging on a door loudly. He immediately armed himself and walked to the front door of his Southeast Austin apartment to see what was the matter. He soon heard a loudspeaker boom that the Austin Police was there to serve a warrant, and could see what looked like an Austin SWAT van parked outside. He could also hear loud bangs which he believes were likely flash bang grenades. Ever the intrepid journalist, Jackson grabbed a camera and attempted to film the raid, which happened to target one of his close neighbors. When Jackson opened his door and began filming the storm troopers, who were outfitted in green ensembles more befitting of U.S. military than police officers, he was met by ferocious barking demanding he get back inside his house. One of the enraged SWAT members next angrily grabbed Jackson’s door knob and slammed his door shut. 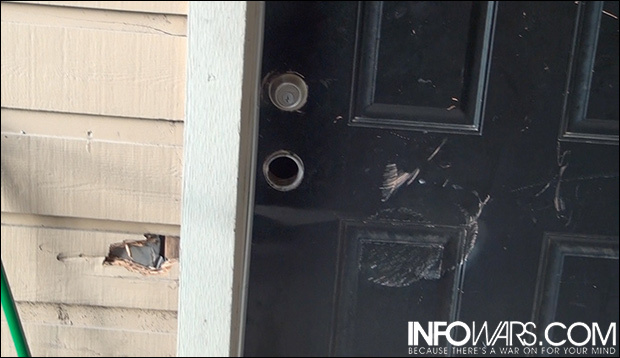 Upon inspection of the raided apartment’s exterior, battering ram marks could be seen as well as a missing door knob which Jackson suspects police used to insert the flash bangs. Jackson is unsure what spurred the raid, but believed it was already over by the time he grabbed his camera to film. He also says he had noticed a heightened police presence in his complex in the days preceding the ambush. Given that the Austin Police Department recently announced it would be coordinating joint “homeland security” drills throughout the city with help from the FBI, the Travis County Sheriff’s Office, and police from the University of Texas, Austin residents can expect to experience more of this police state conditioning in the days to come. Just as we saw in Boston, the federal government has conditioned police everywhere to believe that the general public is their enemy. American slaves are not allowed to document the storm troopers that raid in the night. This is a scene right out of Fallujah in Iraq where, if the occupied peasants dare open their doors, they are screamed at to go back inside and confined as prisoners inside their own homes. Peace officers protect and serve; paramilitary police are there to fight an enemy, and that enemy is the American people. Police chiefs have been on record saying that the black masks are meant to intimidate and hide crimes, just as executioners wear black masks because they’re conducting crimes. The olive drab military uniforms are the equivalent of an enemy flag being planted on America. This is a direct violation of the American peoples’ dignity.